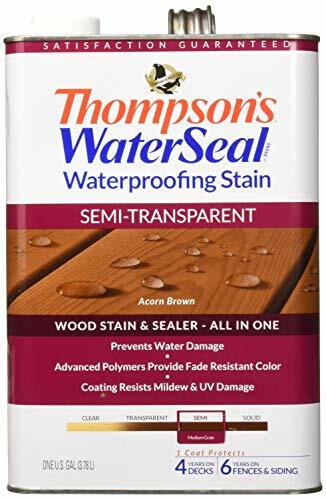 Thompson's WaterSeal Advanced Natural Wood Protector - Specially formulated for wood, Thompson's WaterSeal Advanced Natural Wood Protector provides one-coat maximum strength protection with a coating that resists mildew and UV damage, allowing your wood to maintain its natural color. 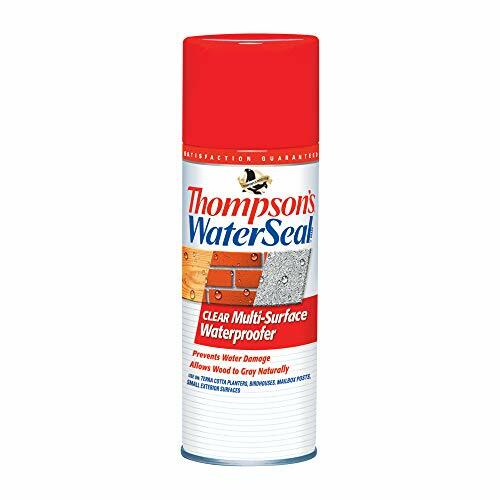 With a patented formula, this advanced waterproofer enables you to clean and treat in one day and to apply immediately to new pressure-treated wood. 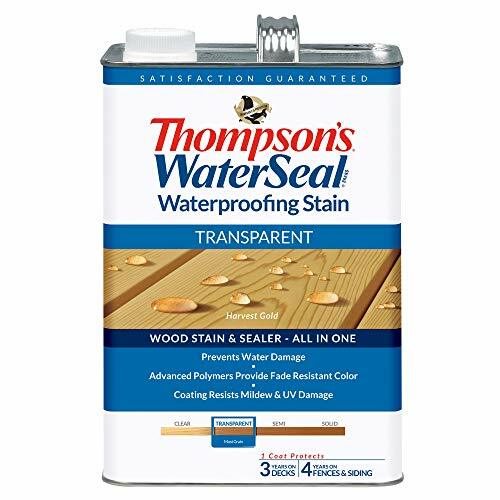 Thompson's WaterSeal Waterproofing Stain provides complete outdoor wood protection. It waterproofs long after the initial water beading is gone. Use on decks and fences, outdoor furniture and exterior wood. Shows medium wood grain and medium color. 1-coat protects 4 years on decks or 6 years on fences and siding. Applies to freshly cleaned damp or dry wood. Prevents water damage. Advanced polymers provide fade resistant color. Coating resists mildew and UV damage. 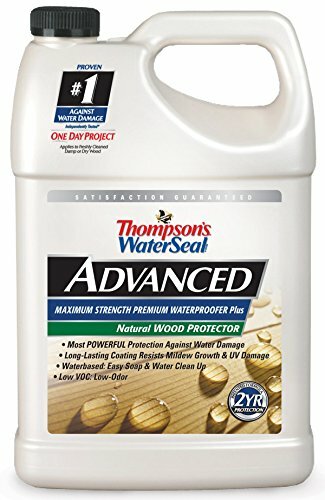 Thompson's WaterSeal Advanced Maximum Strength One-Coat Waterproofer - Specially formulated for wood, Thompson's WaterSeal Advanced Maximum Strength One-Coat Waterproofer provides one-coat maximum strength protection with a coating that resists mildew and UV damage, allowing your wood to maintain its natural color. 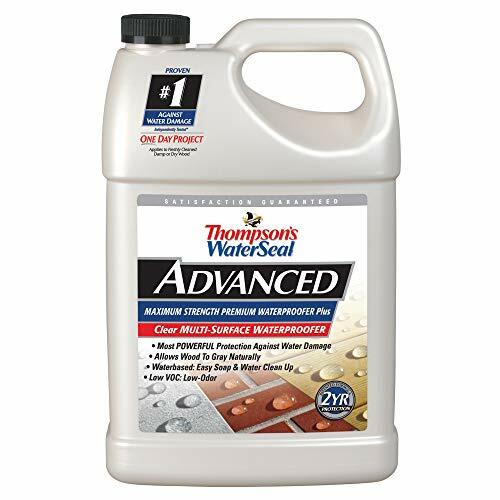 With a patented formula, this advanced waterproofer enables you to clean and treat in one day and to apply immediately to new pressure-treated wood. Exterior wood stain and wood protector that allows some natural wood grain and texture to show, while adding subtle color to the surface. Available in several deck stain colors. Provides 3-way protection for exterior wood. Penetrates deep into wood to protect against wood rot and mildew. 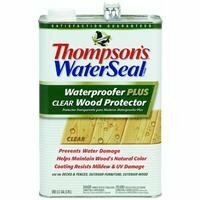 Provides waterproofing protection so wood won't warp, crack, shrink or split from moisture. Also contains a UV absorber to retard the fading and drying that occurs with sunlight exposure. Can be applied over severely weathered, painted, or stained surfaces and is paintable and stainable with oil-based products. Meets VOC requirements in most areas. 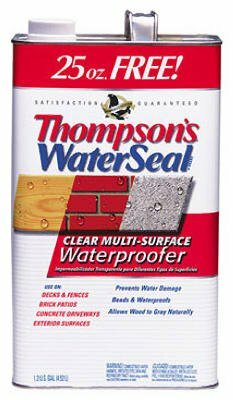 For multi-surface waterproofing that protects wood, brick and concrete and allows your wood to gray naturally. 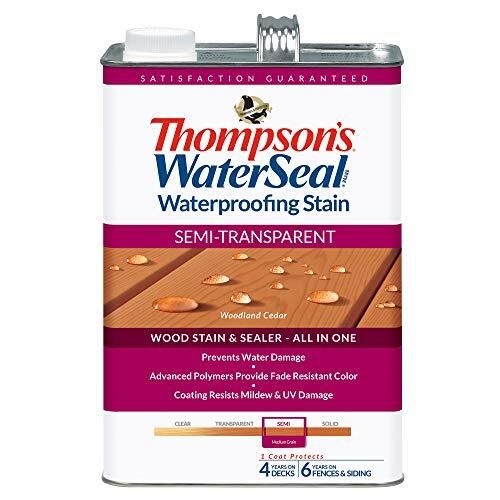 Thompson's Waterseal Waterproffing Stain - Semi Transparent, Acorn Brown. Exterior wood stain and sealer that provides complete outdoor wood protection. Formula is moderately pigmented to add beautiful color, but still show some wood texture and grain.Prevents Water Damage Advanced Polymers Provide Fade Resistant Color Coating Resists Mildew and UV Damage Applies to Freshly Cleaned Damp or Dry Wood. Want more Thompsons Water similar ideas? Try to explore these searches: Ash Equipment Tee, Summer Tub, and 250 Sheet Pack.